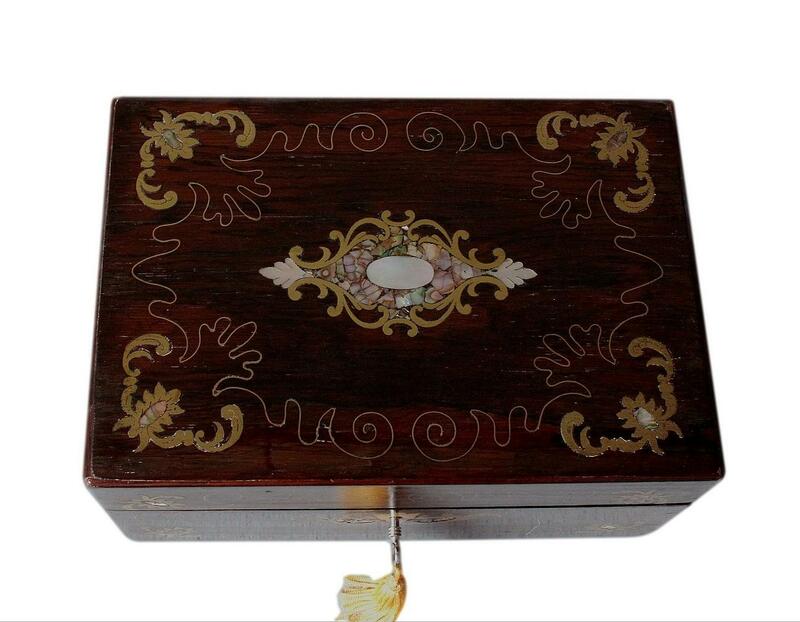 This is a beautiful Victorian jewellery box dating to 1860/1870. 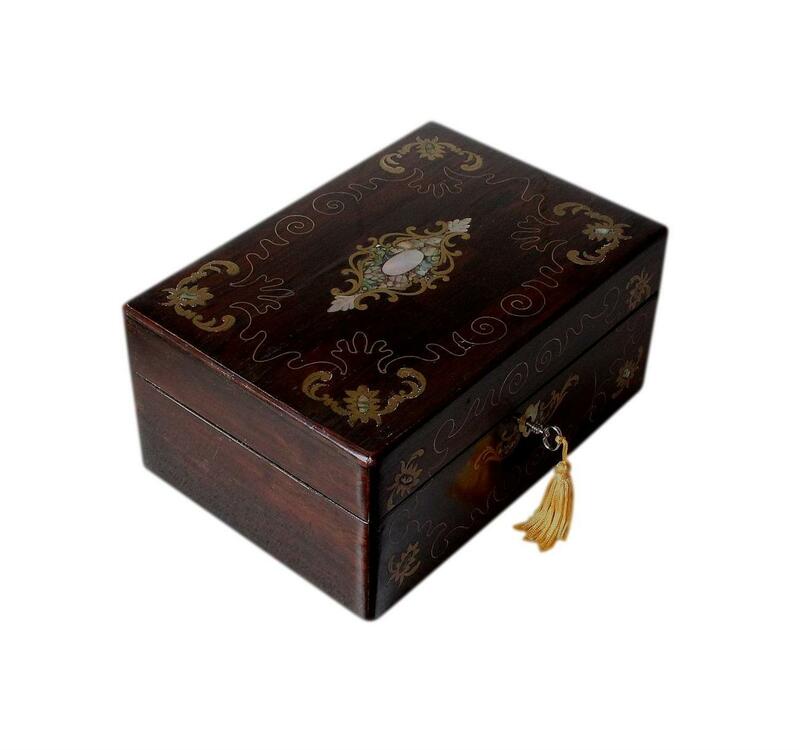 It has a vast array of beautiful inlays and a working lock and key. The exterior has a Rosewood veneer which has a beautiful rich dark colour. 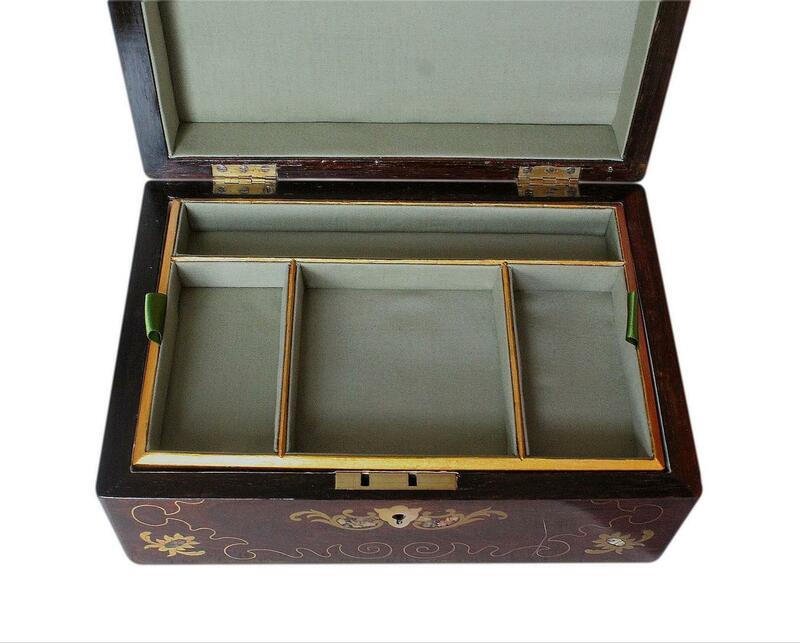 It has an array of brass, Mother of Pearl and Abalone shell inlays which are beautifully set flush into the veneer. There is a lovely inlaid Mother of Pearl escutcheon to the keyhole. The Mother of Pearl and Abalone has lovely iridescent hues of pink, purple, blue and green. It shines beautifully when it catches the light. All of the inlays have a smooth polished finish. 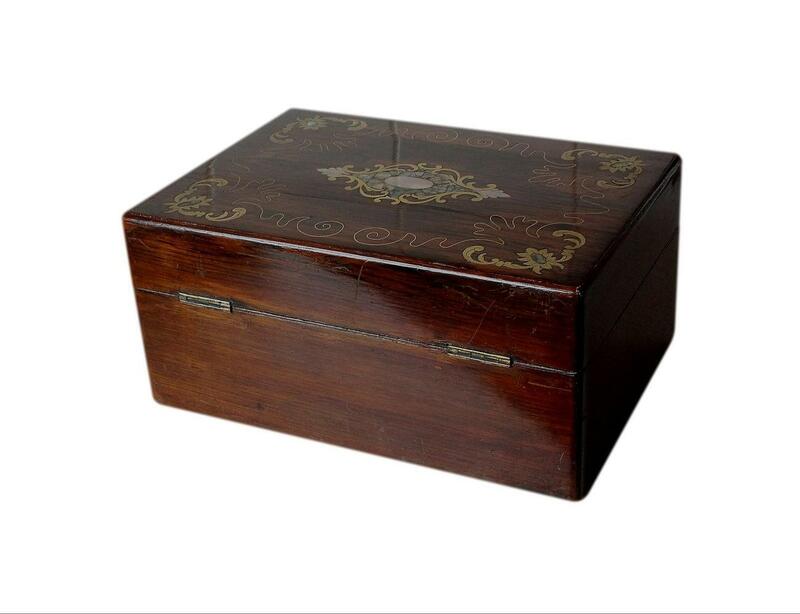 The box has its original stop hinges which hold the lid upright. It also has a working lock and key. The lock is a replacement which dates back to the Victorian period. 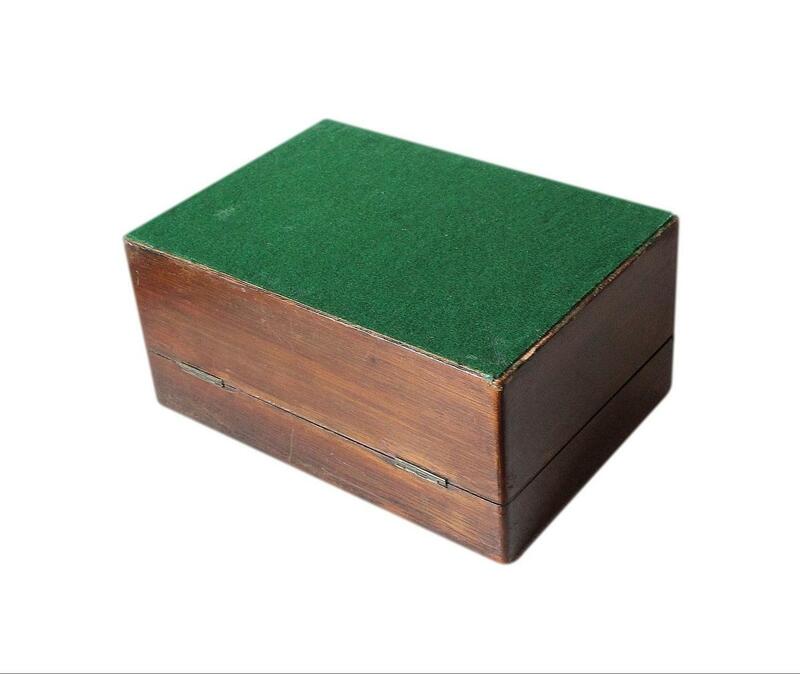 The bottom of the box has an old replacement green felt covering. This will protect the surfaces of furniture. The interior has been beautifully refurbished by our skilled box restorer. 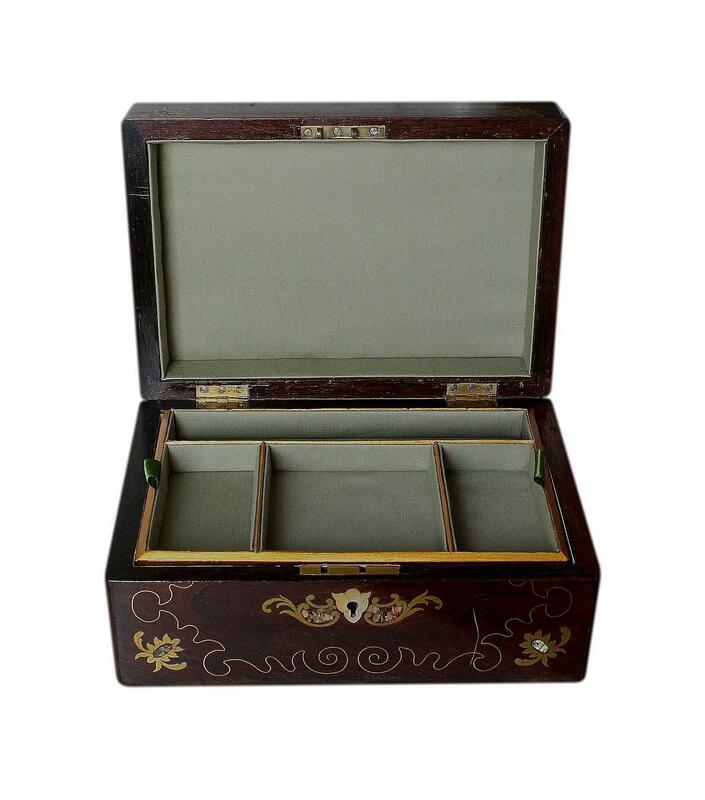 It has its original removable storage tray at the top which has multiple compartments, and its original single large compartment beneath. The tray has been newly French polished and gilded. It has beautiful new sage green satin linings and a new green felt cover on the bottom. It also has beautiful new green silk pull tabs which allow you to lift out the tray with ease. 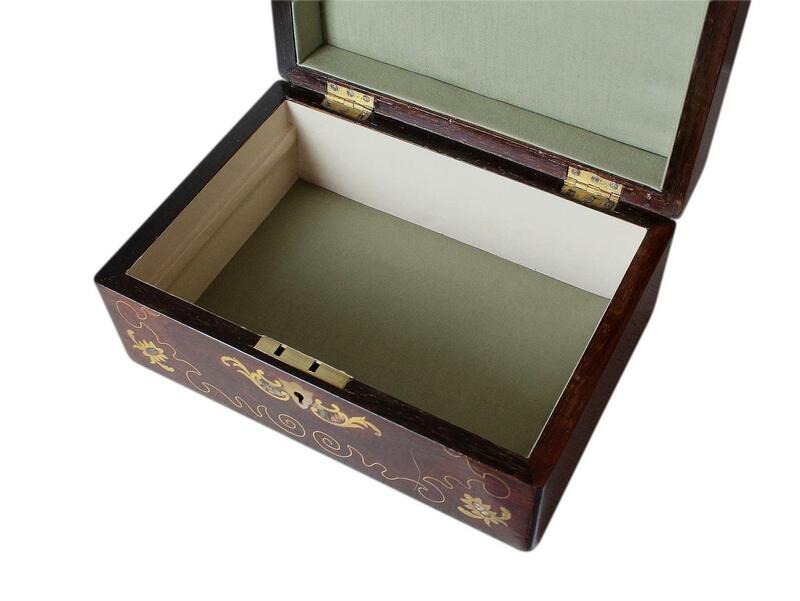 The inside of the lid has a new padded satin panel and satin linings to the walls. These too are sage green, matching those in the compartments. The rear narrow compartment of the storage tray is the ideal length and shape for laying out chains. The front centre compartment is the ideal shape and size for slender bangles and bracelets, and the compartments on either side are ideal for smaller pieces of jewellery such as rings, earrings, pendants and brooches. The lower large compartment is deep and roomy, spacious enough for broader bangles, watches and chunky beads. You can read about our restorer Jim by visiting our About Us page. This box is in very fair condition for its 120/130 years of age. It is structurally sound and is a nice weighty box. There are some age related superficial hairline cracks to the veneer which do not run deep and are not overly noticeable. It has some age related surface scratches though these are predominantly on the back of the box and will not be seen from the front display. There is minor wear on the corners of the box, again not overly noticeable. All of these flaws are commensurate with age and honest use. The interior linings, being new, are in wonderful clean unused condition. The lock and hinges are in very good working order. We would like to make you aware that antique locks can suddenly malfunction at any time. They are already very old and will naturally have some wear from age and use. We are not responsible for locks that malfunction from further age and use once boxes are purchased. You can view our full returns policy which includes locks by visiting our Payments And Returns page. 21.0 by 3.0cm with a 2.0cm depth. 10.0 by 9.5cm with a 2.0cm depth. 10.0 by 5.2cm with a 2.0cm depth. 22.5 by 14.8cm with a 4.5cm depth. International Postage is by Royal Mail International Tracked and/or Signed For postage. Delivery is fast, within 3-5 working days to Europe and 5-7 working days to the rest of the world.